iTunes, Netflix, Amazon and even PSN are all pretty good at distributing downloadable movies and music. But all of these data files, as easy as they are to buy, make for a crappy gift. Let me backtrack for a moment. Someone I know has a birthday coming up, and one item I'd really like to get them is an XBLA (Xbox Live) title. Since the game isn't available in stores, that means I have two solutions. One, I can sneak onto their Xbox like a ninja, enter my credit card info and make the purchase for them (which is just sort of creepy), or two, I can give them an Xbox gift card for the sum of the game. I'm not really happy with either option. My sincere gesture, giving a friend a game they'd enjoy because I've accounted for their tastes, is diluted to an exchange of capital. It's really just giving them cash in a nicer form. Sure, you can buy someone a gift card, but you can't actually buy them a gift. Today, the limitation is probably only bugging me and a handful of other uber nerds. But what about in four or five years? We're a society that's only moving more and more digital. Soon, even giving someone a CD may very well seem like a dated gesture—one that may inconvenience the recipient since, hell, they don't have a CD drive anymore! I just don't want to be condemned to a life of gift cards with a little note written in Sharpie "for the new Batman." But what about an iTunes? UPDATE: They actually offer gifting through email. That's something I didn't realize and I'm guessing a lot of people don't realize. Including even custom playlists, I'll admit, it's a good start. My question to you is, do you consider an email link enough? Does that feel like a gift? Maybe it's just my perspective that will be forced to change as I bow to the next level of consumerism. 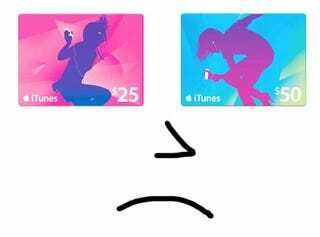 But for the moment, the gift card approach feels like a one size fits some philosophy being squeezed over nearly the entire modern home entertainment industry—and I can't imagine it's adding a lot of humanity to the already cold digital realm.